I love poetry, if music was non-existent poetry would be my number one obsession. Instead of spending allowance on cd’s and vinyl in target and on eBay I would spend my money and time in the poetry section of used book stores. Of all the amazing poets of today and of the past my favorite is definitely Oscar Wilde. Born October 16th, 1854 in Dublin, Ireland; Oscar Wilde is extremely popular and remembered for his work as a playwright and poet. I love Oscar Wilde’s work so much because he wasnt afraid to say what he was thinking no matter how many people disagreed with him, I feel as though almost everyone secretly agreed with Oscar Wilde they just didn’t speak up. 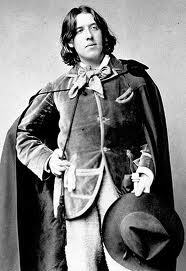 I love the pictures of Mr. Wilde in which he is wearing a cape, hat and holding a cane, he was so unlike anyone of his time and he wasn’t afraid to show it off he was beyond proud of it.